Size of Male: 7-13 lbs., 8.5-11.5 in. Size of Female: 7-13 lbs., 8.5-11.5 in. The Havanese dog always manages to draw attention because of its high price tag and delightful disposition. It is rather a mischievous-looking dog with adorable almond eyes and a jolly gait. 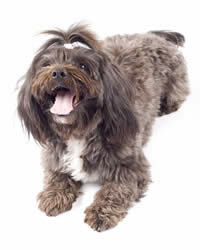 A relatively old breed, the Havanese has Cuban roots and descended from the Bichon family. The breed is known in fact as Cuba’s national dog. The Cuban elites made the dogs their pampered pets. Later, the breed served as show performers and was transported to Europe to wow audience and circus goers with tricks. America welcomed these little dogs in the 1950s. Since then, their role has diversified. Some served as children’s playmates. A few took on the function of herders. Others became cute watchdogs and faithful home companions. When you compare their lives then and now, they send out one strong message: They dig attention. The well socialized Havanese might be compared with a ray of sunshine. This dog breed has the ability to improve your mood and evoke laughter. It will entertain you with clownish antics and will form very close bonds with you and your household. On the downside, the small pooch is also quite a noise maker. It barks at the slightest commotion. Without early socialization, the dog tends to be snobbish and a bit fearful. Living Environment – The tiny pooch is not suited for the great outdoors. It will follow you around the house, and inside the home is where it should stay. Remember to keep your things organized and leave no objects lying on the floor. When seeking attention, they will likely engage in destructive chewing and biting. Grooming – Though known to be a nonshedding breed, this dog’s hair can grow to be 6 to 8 inches long and brushing is a must! The recommended frequency is once every 2 days. Neglecting to have their hair brushed and clipped will result in unsightly matting and tangling. If you’re too busy to groom your pet, then prepare to cough up a budget and hire professional groomers to take over. Diet & Exercise – Whatever your excuse may be, it’s never a good idea to feed the Havanese with table scraps. Experts recommend instead that their diet contain a blend of proteins, fibers, fruits, vegetables and carbohydrates. The breed’s exercise requirements are easily met with a game of fetch or a brief walk on a leash. So long as there are humans to interact with, they can generally take care of their mid-level need for movement. Health – No major dog health problems are associated with this breed, although a few are occasionally diagnosed with cataracts. Otherwise, these dogs have earned their bragging rights to one of the cleanest bills of canine health ever. Tricks and housebreaking seem to take opposite directions with the Havanese. Dog training is relatively easy when it comes to performing tricks. However, they can be challenging to housebreak.